Above: Col Burne accepts the Trophy on behalf of the Retirees Group from RailCorp Chairperson, Elizabeth Crouch. Photo: Courtesy of Office of Rail Heritage. Leadership, Management or Organisational Development. 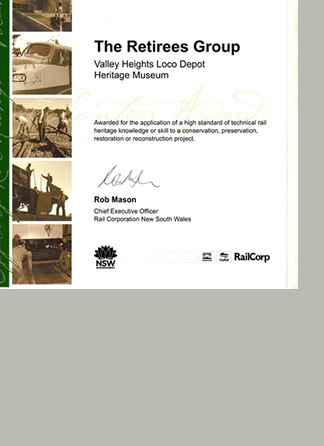 Rail Heritage Conservation, Preservation, Restoration or Reconstruction. Above: The Certificate presented to the Retirees Group. Since the awards inception a number of nominations from the Museum and STaRPS have been made. Last year our Chairman Ted Mullett, was nominated and was successful in the category of Leadership, Management or Organisational Development. This year the Museum Retirees Group was nominated for their outstanding work and achievement in their work on the former DLE’s Building and the current work on the Roundhouse windows. It is with much pride that we advise the membership that the Retirees Group won the Award in the category of Rail Heritage Conservation, Preservation, Restoration or Reconstruction. Col Burne represented the Retirees on behalf of the Group’s Leader Dave Torr at the Awards Presentation Ceremony on 27th July 2009 at the Powerhouse Museum. 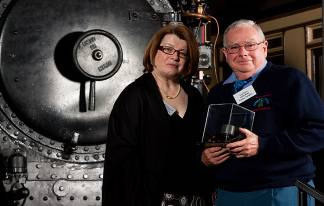 Col accepted the award from RailCorp Chairperson, Elizabeth Crouch in the presence of Museum Chairman Ted Mullett and Vice Chairman Ted Dickson who were also in attendance to witness the occasion, following an earlier seminar conducted by the Office of Rail Heritage. The trophy is engraved and mounted in a clear case. A certificate, (copy above), was also presented to Col for the Group. The certificate is to be framed and both the trophy and the certificate will be displayed in the Museum for visitors to admire. This will enhance the awareness of our visitors to the valuable contribution made by our volunteers. The Museum has also decided to have copies of the certificate reproduced and individually presented to the group members for their personal keep sake. Congratulations and well done Retirees. Page Updated: Wednesday, 07-Nov-2018 13:34:12 PST.